There are many photographers in Taiwan and capturing images of the Taiwan High Speed Rail is a popular subject, including drone video of the old steam locomotive in Hualien. Do you know that Eight Arch Bridge in Taitung was featured on Lonely Planet as one of the best destinations in Asia? Experiencing the defening roar of aircraft flying low below you at Aircraft Lane and why you should be there soon by this year! Worth your follow! This week's honorable mentions: @___hzy___, @edisonboyyy, @gabrian_official, @mt_blackguy, @lindawuxoxo, @chung_uncle_fish24, @leo__524, @haixing0527 and @ygt1016. Well done! . To get featured? Follow us, like, view or_comment on our posts. 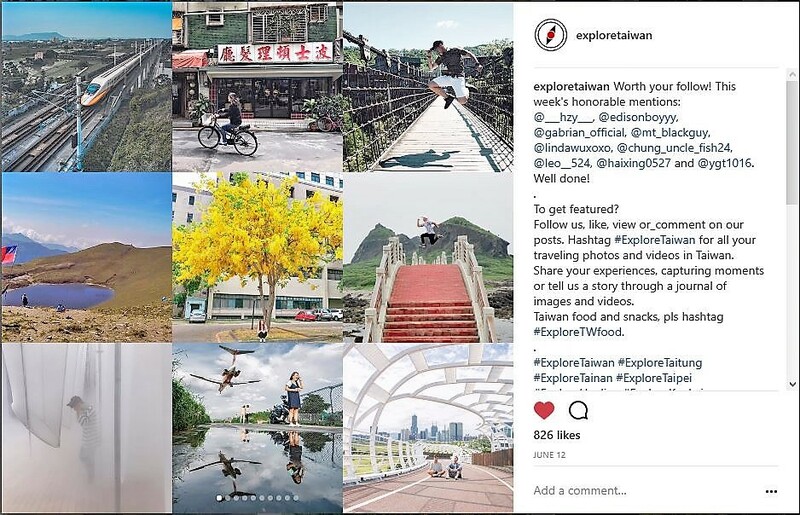 Hashtag #ExploreTaiwan for all your traveling photos and videos in Taiwan. Share your experiences, capturing moments or tell us a story through a journal of images and videos. Taiwan food and snacks, pls hashtag #ExploreTWfood. . #ExploreTaiwan #ExploreTaitung #ExploreTainan #ExploreTaipei #ExploreHualien #ExploreKaohsiung . There are two main train services across Taiwan, Taiwan Railways Administration (TRA) and Taiwan High Speed Rail, HSR. Both, TRA and HSR, having different operators. TRA is an agency of the Ministry of Transportation and Communications of Taiwan, whereas HSR is privatised by Taiwan High Speed Rail Corporation (THSRC). For many photography enthusiasts, this enduring iron giant is worth the time waiting to capture images within the few seconds as it passes by. In the early spring season, local will rush to Alishan National Scenic Area to capture forest train passing through cherry blossom trees. Now in Summer, there’s a popular train ride of the fascinating steam locomotive in eastern Taiwan. The ride with the puffing black giant is a rare trip serviced by TRA. There have named the event “2017 Summer Formosa (Air-conditioned) Yuli to Taitung.” Mainly the eastern region of Taiwan island. Only limited to a few days of the trip. More info 2017 Summer Formosa (Air-conditioned) Yuli to Taitung. On the outlook, it is neither modernised nor high-class but more like a mom-and-pop barber shop for regular local customers and students. The first 3 Chinese characters (波士頓) have distinctively translated into “Boston”. Name of the shop has large prints, clear and striking colors and very instagramable to many young ones. Tamkang University Taipei Campus is also located nearby. This particular campus focus on continuing education. It has a distinguished recognition as Taiwan’s oldest private institution of higher learning. It is easy to go there. The suspension bridge is only 100 meters away from the Shifen Station (十分站). There is no online system to buy direct train ticket to this place. Head down to the ticket counter of train station to inquire. On the ride, make sure to switch from Taipei Line to Pinghsi Line for a local train to Shifen Station. There are some interchanges, depend on which route you are taking. Chiaming Lake in Taitung County is also known as the Angel’s Teardrop. It is the second highest alpine lake in Taiwan. Elevation at 3,310 m above sea level. How this lake is formed remains a mystery. Geologists theorize the formation of this lake from a forceful meteorite crush to the possibility of glacial cirque formed million years ago. Whatever the cause, it is the Mother Earth worth appreciating. Interested in seeing one in Taipei? You need to explore to nearest mountain Taipei, Qixing Mountain. Locally named as Qixing Lakes. Not known to many and no directions are given. There are two lakes, one on the higher ground. Small in size but looks calm, tranquil and serene. It’s a short trail into a dense and tall vegetation. Because it is of small-scale, the presence of water is not all-year-round. Plus, the trail to that small lake could be muddy. Usually, hikers would continue up the path to the peak of Qixing mountain without noticing the small entrance. Where is the small entrance? The trail head to Qixing mountain is at Xiaoyoukeng Recreation Area bus stop. Walking up a short distant of about 200 meters, you will be able to find the small entrance on the left. Best time to visit is November to February when season is dry. Not to forget the same season when wild silver grass (Miscanthus sinensis) flourishes invasively into the mountain sides. Silver grass (Miscanthus sinensis) is fabulous ornamental flowering plant for landscaping. Not a tourist place but more to the local residents and students in that city. Why flowering tree is often refers to Tainan city has got to do with its long history and culture of over 350 years. That includes fruit production and desserts like Mango Snowflake Ice. Touring Tainan City by truely experiencing the place, you must have the luxury of time to live in the oldest capital of Taiwan. Many tourists cycle even there are of one-day tour. Check out this official site of T-Bike from Tainan here. “Bounded by green hills and the turquoise Pacific, Taitung is Taiwan’s secret wild card…” Read on. You might want to read more on this official site East Coast National Scenic Area. This art installation is now exhibiting in Taipei Fine Arts Museum. The design is by Serendipity Studio + Kuan-Wei Chen Architects. Built consist mainly of scaffolding and mist, depicting a scene of mystique with the juxtaposition of dreams and reality. Exhibition ends 30th July 2017. Hurry up for see the final bit of the show. More info here. The giant aircraft fly low. Very low, indeed. Only meters above you. The roar of jet engines passing by for landing while you are standing under that fat belly of the carrier is immensely loud! Anyway, that’s the thrill, isn’t it? If you want to experience that, it’s better go now then never. Plus, be there 3 hours too soon than a minute too late! Back in March 2017, Taiwan’s aviation authority, Civil Aeronautics Administration, has acquired the nearby land and also announced that there are going to build the restriction wall. This adds restrictions (the fact it’s about safety) to all photography enthusiasts who love to visit that particular lane nearest to the runway. Wall is said to complete by next year. The architectural steel bridge was officially opened on April 2013. The overhead bridge is a network of tri-routes to facilitate daily commute of cyclists and pedestrians to Cianjhen Star Station for LRT transportation, Kaisyuan 4th Road and Zhongshan 3rd Road.